One of London's most important post-war Grade I listed buildings. 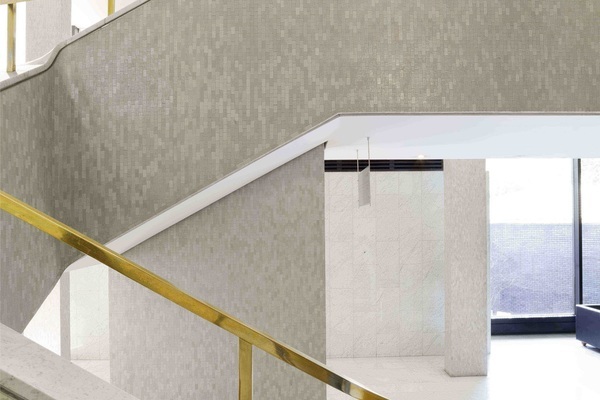 Dramatic interior spaces and white mosaic exterior elevated on piloti and distinct modernist lines. The Royal College of Physicians (RCP) is one of London’s most important and provocative buildings. 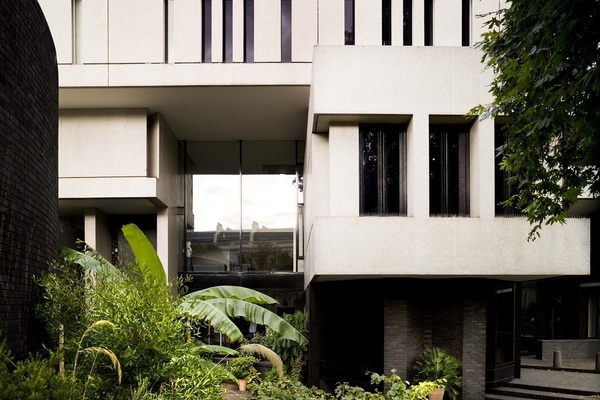 Designed by British architect Sir Denys Lasdun (1914-2001), the building is set amongst the Regency terraces of Regent’s Park – one of only ten Grade I listed post-war buildings in England. The Regent’s Park building was commissioned in 1959 and opened in 1964. It is the RCP’s fifth home since foundation in 1518. The RCP was given permission to demolish a bomb-damaged Nash villa on the site on the condition that the new building harmonised with its surroundings. 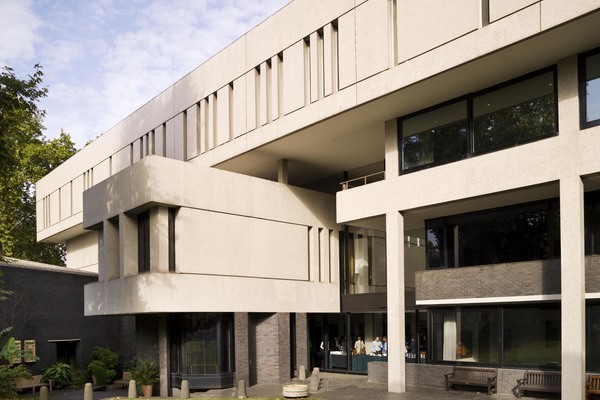 Lasdun was appointed after making it clear that he would not create a classical building. 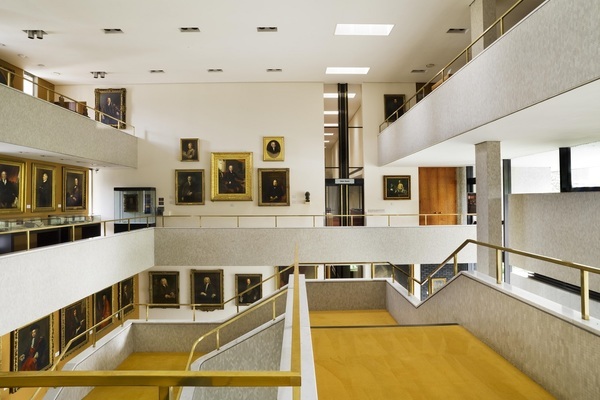 In 1992 Lasdun was awarded the Royal Institute of British Architects’ Trustees Medal in recognition of his work at the RCP, considered to be ‘the best architecture of its time anywhere in the world’. 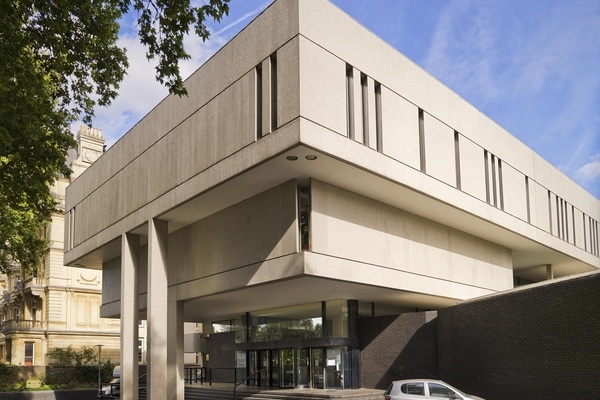 Lasdun’s creation places five hundred years of RCP tradition and collections at the heart of its startlingly modernist design. The entrance of the building features a striking outward cantilever. Arrow-slit windows pierce the front of the top layer relieving the otherwise blank walls. The main building materials are blue engineering brick, creating surprising curves that contrast with the straight lines dominating the rest of the building. Elsewhere mosaic porcelain tiles are used. The Lasdun Hall shows the influence of Le Corbusier on Lasdun with his use of ‘free forms, floating in space’. Light floods the Hall from the enormous windows looking out over St Andrew’s Place. The marble hall was created for ceremonial processions which wind up the magnificent squared spiral of the flying staircase. 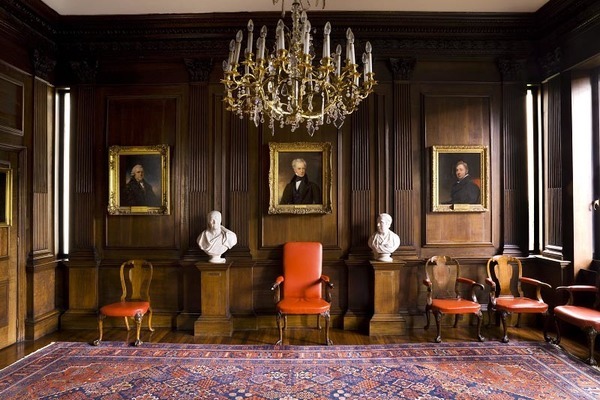 The Censors’ Room is lined with 17th century oak paneling originally from the College’s third home in Warwick Lane. Lasdun considered the Censors’ Room to be the ‘heart’ of the College and placed it in the centre of the building. 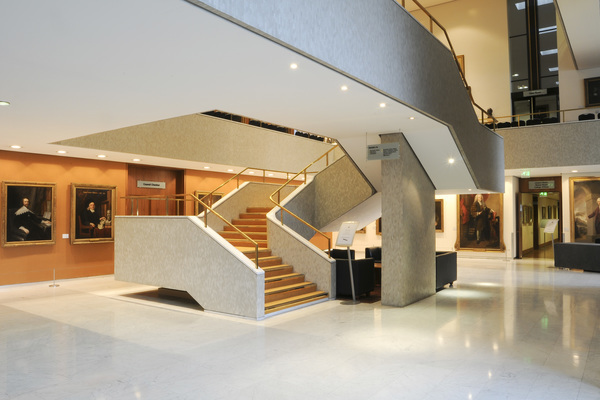 The Council Chamber is part of Lasdun’s 1995-96 extension. It can be flooded with natural light from an ingenious hidden circle of skylights around the central dome. Lasdun described it as one of only three ‘entirely satisfactory spaces’ he created. The Wolfson Theatre is the larger of the RCP’s two lecture theatres. 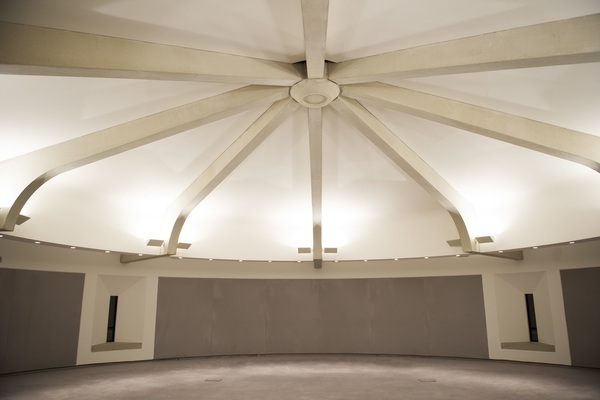 Of note are the curved booths, clad in African hardwood, the gently curving textured concrete walls and the tiered slabs of the ceiling – best seen from the stage. 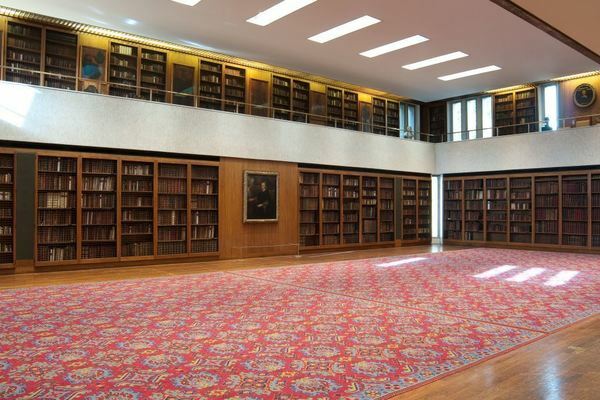 Lasdun described the Dorchester Library as the ‘brain’ of the building. 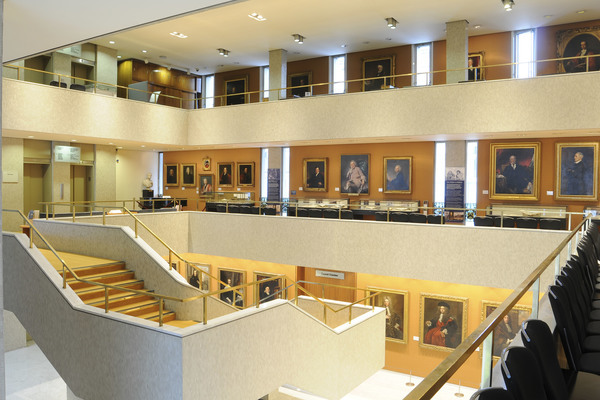 There has always been a Library in the RCP and over the centuries fellows have donated books to build one of the finest collections outside Oxford and Cambridge. The Osler Room is the RCP’s formal function and dining room. It rises two storeys high (mirroring the Dorchester library) and features one of the few working hydraulic walls in buildings of this period.